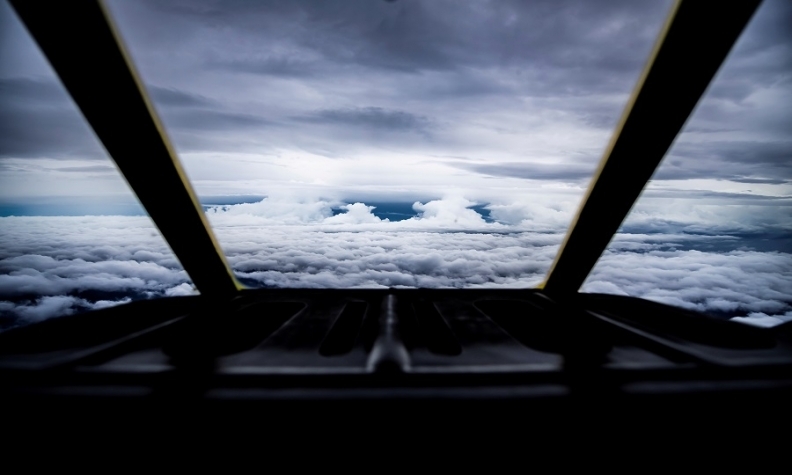 A U.S. HC-C130J search and rescue plane approaches the edge of Hurricane Florence. As the fringes of Hurricane Florence begin to slash the Carolina coasts with heavy rain and strong winds, Japanese supplier Denso suspended operations Thursday at its Greenville plant in North Carolina. The ASMO Greenville plant, which produces front wiper motor linkages, rear wiper motors, arms and blades and radiator fan motors, was closed at 1:30 p.m. in anticipation of the storm, Denso spokeswoman Julie Kerr wrote in an email to Automotive News. "Right now, our plan is to resume production tomorrow afternoon, but that will depend on the severity and impact of the storm on our employees and the community of Greenville," Kerr wrote. "Our top priority is the safety of our employees." German supplier Bosch temporarily ended operations Tuesday at its fuel-injector plant in Charleston, South Carolina, prompted by the state's evacuation plan. The supplier suspended operations at three facilities, including a warehouse in Summerville, South Carolina, and a plant for its home appliances business in North Carolina, at 10:30 a.m. Tuesday, Bosch spokesman Tim Wieland wrote in an email to Automotive News. The plant produces fuel injectors and antilock brake system components. Ahead of the storm, South Carolina Governor Henry McMaster ordered a mandatory evacuation of the state's coastline counties starting at noon Tuesday, the Island Packet reported Monday. "We are continuing to monitor both our facilities and traffic routes in the area and are in close contact with the authorities," he wrote. Auto suppliers have been expanding their presence in the Mid-Atlantic in recent years as automakers BMW, Volvo and Daimler have all built or expanded assembly plants in the region. Bloomberg, in a report published on Wednesday, said auto parts suppliers own 239 production and distribution facilities in the Carolinas and Virginia. Suppliers such as Bosch own multiple plants in the region. Bosch also has a high-tech sensor plant in Anderson, South Carolina, and a hydraulics plant in Fountain Inn, South Carolina. Between 2013 and 2017, Bosch poured roughly $1.5 billion in the U.S. operations, including work to boost mobility solutions manufacturing activities at its plants in Charleston and Anderson. "We cannot at this point comment on possible impacts on our business -- this will depend on the force and duration of the hurricane," Wieland wrote. "We are currently evaluating the effect on our supply chain. Our aim is to uphold delivery to our customers." The storm is expected to "crawl near or along" the Carolina coasts through Friday and "produce catastrophic flash flooding and major river flooding," according to The Weather Channel, with possible landfall expected either overnight tonight or Friday. In a statement, IHS Markit analyst Stephanie Brinley said IHS expects "minimal sustained disruption" to the U.S. supply chain. "There is risk for disruption of the operations at the Port of Charleston in particular," Brinley said. "However, automakers across the country recognize the supply chain risks in the event of flooding and have likely been taking precautionary steps to minimize or eliminate their exposure. This can include allowing suppliers in the storm's path to pull ahead their requirements where possible." ZF Group's transmission plant in Gray Court, South Carolina, is currently running as normal, spokesman Gary Mason wrote in an email to Automotive News, but the supplier is keeping a close eye on the hurricane and its impact on the communities close to its facilities in the region. "We are in continuous contact with our facilities in the southeastern U.S., and plans are already well underway to prepare those facilities for the storm," Mason wrote. "Our operations have not been disrupted so far at our plants in Gray Court and Duncan, South Carolina, or our other facilities in the region, but we are ready to adjust our plans as events warrant." At this time, no delivery delays are anticipated at its plants, Mason wrote. He has not been informed of any employee evacuations.